This year I was reunited over long distance with my biological mother. After 45 years of no contact at all with any birth relatives, no knowledge of their whereabouts or identities, I was able to return from the left-for-dead (tactfully, not on Easter weekend). It has always seemed important to me, since before there was an internet to compound errors in judgement, that I remain mindful of my position as a person who identifies as an adoptee with respect to the privacy of my birth family. It is certainly not a position I would expect any other adoptee to take up; it is a personal principle based on my circumstances. Last spring I was in a music rehearsal for a fundraiser for a friend. 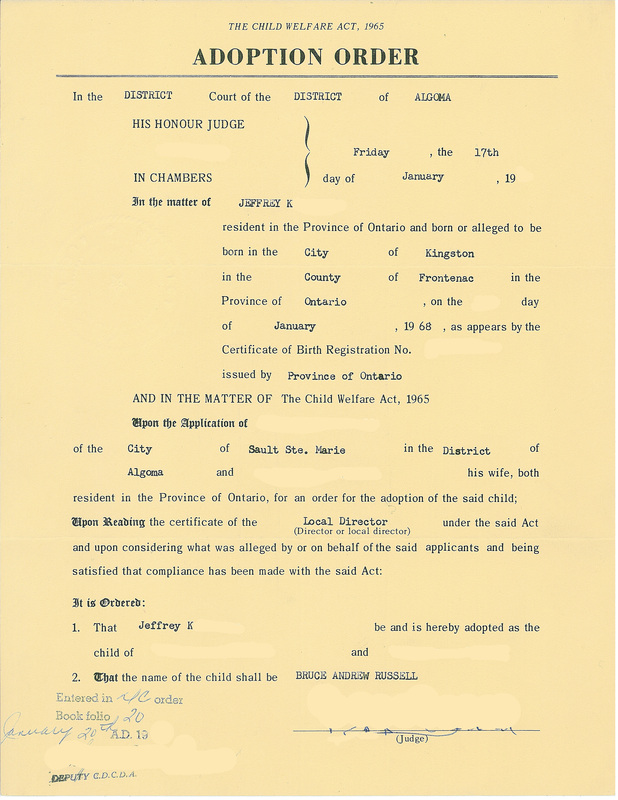 A few short weeks earlier I’d taken up the online offer of a search angel, herself an adoptee reunited decades ago, and provided her with birth information I had obtained through the Children’s Aid Society and the Ontario government, which included identifying data made available by recent legislation. And 45 years into the long set of moves that proceeded this one, I put the search the back of my mind and focused outward. During a break in rehearsal I checked my phone. There was a text and an email. Not only did my phone now know this new thing about me that I did not yet; in its cache was a virtual person with a bio, history, website, media coverage, posted images, and social networking accounts. And one unfortunate pocket tap could have messed things up quick. Fortunately, the woman who helped me was extremely experienced in dealing with all of this. Her passion for it, working out of one corner of her own very busy life, was apparent. I am thankful for her. But hold on, I was a few minutes away from going back to singing and playing music as the guy who was suddenly a previous update of me, who had known nothing about this one primal relationship. I have an adoptive mother who raised me, and we have a strong and continuous bond. And now I also had a new backstory. Which included evidence of my bio mother’s formidable and still active career in music. Among other attainments, she once performed in a premiere by an iconic composer at the opening of a legendary venue. She had supported herself most of her long life as a musician. And at what would be retirement age for many, she had recorded a CD of virtuoso material she was still well in command of. She was in the process of completing a new academic degree. She was also a great grandparent. I went back to singing and playing that afternoon and being the guy, secretly updated. I told only family and one or two friends. I still had to find out whether there would be actual contact. And there has been. The process was slow at first, and I can only imagine how frightening it might have been for her for me to suddenly come forward. She trusted — with some vouching for — that I would not be indiscreet or invade her privacy. She called me on a weekday morning, when I’d inexplicably delayed leaving for work. We spoke for exactly ten minutes. We spoke nervously and quickly, sometimes overlapping. I asked her if she was well and she said yes; I took great comfort in this one exchange. She took my address. I didn’t go into work afterward. My wife thinks things may happen inexplicably but not without a reason. My paraphrase. I had sought a quiet place to take the call and found myself in my older daughter’s room, the child who had been my first introduction to a blood relative. Afterwards I was numb on a whole new level. Still, I buried my face deeply in the covers of a bed I was too long for and had to curl up to fit on, silently cried and whispered thanks. She told me she had tried to locate my biological father after hearing from me. It had been many years and she was unsuccessful. She told me his name and that he was from Detroit. That she had been pregnant with me while she lived in Ethiopia. They were both musicians, who played together professionally. She promptly sent a letter, her CD and recent photos. She looked young for someone of her years, and beautiful. Eventually, after months, I reciprocated. She was positive about my music which was affirming. I was in awe of her talent and a little dumbstruck. We have spoken again since, once on the anniversary of the March on Washington. We joked about Auto-Tune as fellow musicians, that was trippy. Even trippier was seeing her name automatically appear in my iTunes. Update indeed. I am content to let things transpire slowly and naturally. I don’t have any particular expectation leading from the revelation and initial contact. I do have joy around it. What I want to have always is awareness and above all compassion. It has been a year of origin stories. A genomics service to which I subscribe has also mapped out new countries of ancestry for my black side: Haïti and Jamaica. So I would also come to know a little more about my father after all. I’m grateful to my wife for her support, and sometimes worry, during this process. For most of my life, I have been someone who was for the most part visibly, identifiably mixed race black, but lacking any other evidence of my ethnicity — biological relatives, genealogy, language, cultural items or history — beyond an adoption file that listed me as “Negroid.” I had no roots. I knew that my white heritage was English and Irish. Unlike black peers who have often been asked where they were really from and to protect their dignity might simply answer “here,” I didn’t even have somewhere to refer back to had I chosen to disclose. Beyond being racialized, I was/from nowhere. With this theme in mind, the title of the piece is a reference to the poem “I Am – Somebody” written in the 1950s by Reverend William H. Borders, Sr. and widely popularized by Jesse Jackson. There is a procedural approach to harmony, with root-progression clusters moving in parallel, alternating diatonic, harmonic minor and melodic minor scales. The music has nothing to do with the subject per se, but seems to fit with it terms of weight, density and tone. It is a reflection of my frame of mind during these developments. Some sense of mystery is present. This is my order, redacted. Me in a page, outlines obscured. I’ve written about the joy I feel now many years later, reflecting back on earlier struggles with some wisdom of experience (albeit self-proclaimed), and gratitude. I don’t know if I feel like I’ve ever actually entered black culture, if I belong to it, after twenty-seven years in the city, but to know it was here and to know something of what it might be in relation to me is enough. I will always feel parenthetical, which is a kind of belonging. And more recently, the identity revision of personal genomics is yet another kind: now I can say with some conviction that I have island roots. My early childhood is sometimes stored more in memories of moods and sensations than anything else. My mother says at Christmas I would get depressed, and wonder aloud why my biological mother had not sent me anything, not even a card or letter. It was a time of closed adoptions so such a thing was highly unlikely. There are a few square-frame, long-faced holiday photos which survive, along with photos of adopted nuclear contentment. It was somehow anticlimactic when, after forty years of generally not expecting anything, a letter arrived. From her. Last week. It added a geographical connection with Ethiopia to these narratives. It spoke to how there is always a return. After all that time, this year I was suddenly adoptee, full circle. And suddenly something of an immigrant in all but birth. The letter wasn’t the first one, but it arrived around the time of my second daughter’s first birthday and near Christmas. I don’t connect with the holiday the way I did in my youth but the significance, coincidental, wasn’t lost. Over a decade ago, I received non-identifying information including an oral history from my birth mother. Not just a narrative but a story. Five years ago, new legislation allowed me to obtain the long form birth certificate containing my biological parents names. Or one, at least. Two years ago a search angel, herself an adoptee, found my profile in an adoption group on social media and offered to help. My life had been so busy I missed her email for over a year. Within days of putting that one name forward, a person came back. Being a parent, to at last be in the presence of beings whose biological continuity I shared, is somewhat magical. Add to that a new sense of fulfillment through the potential to extend our shared line further back in time, locate ourselves elsewhere on the map. Thanks to my wife Nehal El-Hadi for helping me put this post together.